His Grace Bishop Basil and the community of St. Luke Antiochian Orthodox Church of Erie, CO.The Liturgical Texts for October, blessed by His Eminence, Metropolitan Joseph, are now ready for clergy and laity to download from the Online Liturgical Guide. Every year, on the Sunday that falls from October 11-17, inclusive, the Orthodox Church celebrates the 350 Holy Fathers of the Seventh Ecumenical Council, convened in Nicaea in 787. They refuted the Iconoclast heresy, whose camp believed that all depictions of Christ, His Mother and the saints should be destroyed. The council decreed that the veneration of icons was not idolatry because the honor shown to them is not directed to the wood or paint, but passes to the prototype depicted therein. 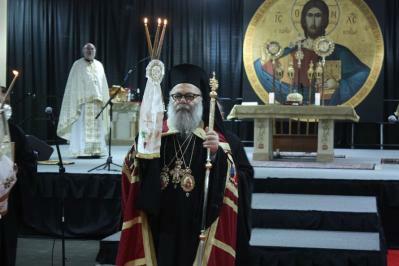 The Most Reverend Metropolitan Joseph, Archbishop of New York and Metropolitan of All North America, blessed the Clergy and faithful of St. Elias Antiochian Orthodox Cathedral in Ottawa by presiding over the celebrations for the 85th anniversary of the parish and the 15th anniversary of the consecration of the Cathedral that took place from September 9-13, 2015. This historical visit was the first visit of His Eminence to Ottawa after his election as the new Metropolitan. His Eminence arrived in Ottawa on Wednesday, September 9th, 2015. The Very Rev. Fr. Ghattas Hajal, Pastor of the Cathedral, alongside Assistant Pastor Fr. Nektarios Najjar, the parish council, a representative of Ottawa's mayor and the organizing committee of the event welcomed our Father in Christ Metropolitan Joseph at the airport's V.I.P. Salon. 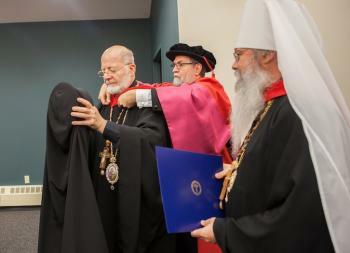 Additionally, His Beatitude the Most Blessed Tikhon, primate of the Orthodox Church in America, was awarded with an honorary doctorate as well. Greetings and blessings as you begin the 2015 Church School year! We have a few new resources for you. As you can see above, if you are thinking of using the GOA texts as well as those of the OCEC, there is a document that compares text by text. Don't press print before reading it as it is 23 pages. In years past, we have had the request for the 100 educational standards from the 8th grade text, The Way, The Truth, and The Life; these questions and answers have been prepared according to the order in which they appear in the text. In addition, we have prepared flashcards of these same questions. These can be used with high school classes for brief reviews of the material. They can be used in a jeopardy-style game, or as simple flash-cards. Another new item is found under Resources, the listing, "Online Resources for Parents and Teachers" compiled by Kristina Wenger who does the AODCE Social Networking Ministry. All of our social network ministry sites are listed in the Convention Report, see below. "As the Cross is lifted up, it urgeth all of creation to praise the immaculate Passion of the One Who was lifted up thereon. For by means of the Cross, He slew him that slew us; and He made the dead to live again, making them beautiful, granting them the Heavens as dwelling-place, because He is compassionate, in the unsurpassed and unspeakable excess of His goodness. With joy, then, let us all exalt His Name, while magnifying His infinite condescension toward our race." We greet you with love and joy on this Feast of the Elevation of the Precious and Life Giving Cross. The Sticherion from the Vespers of the feast which is quoted above transmits to us the essence of this feast. The lifting up of the Cross upon which our Lord and God and Savior Jesus Christ was crucified draws us near to His passion, and reminds us that He has defeated Satan and all his power once and for all. By His Passion He brought life to those who were in the tombs, restoring them to the beauty with which they had when God created them and opening up the heavens as their dwelling place. Lastly, He did this not only for those who were in the tombs, but for all of us who place our hope in Him. Bishop Thomas presides over the Procession of the Holy Cross on the Feast of the Exaltation (Elevation) at St. George in Allentown, PAThe Liturgical Texts for September, blessed by His Eminence, Metropolitan Joseph, are now ready for clergy and laity to download from the the Online Liturgical Guide. September 1 begins the Ecclesiastical New Year because, for the ancient Hebrews, it was the beginning of the civil year, the month of gathering the harvest and of the offering of thanks to God. On September 6, the Orthodox Church commemorates the Archangel Michael delivering from destruction a church and a holy, miraculous spring named for him in Colossae of Phrygia (modern-day west-central Turkey). Like August, September features two of the twelve Great Feasts of the Orthodox Church: the Nativity of the Theotokos on September 8, and the Exaltation (Elevation) of the Holy Cross on September 14. The following article inaugurates a new series on Antiochian.org. 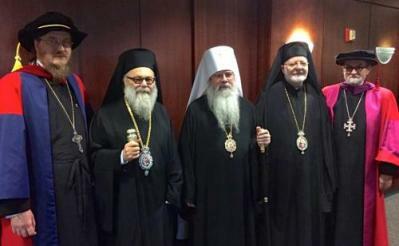 In "Antiochian Profiles," we will feature some of the many eminent Christians of past and present who have found a spiritual home in the Antiochian Orthodox Christian Archdiocese of North America. 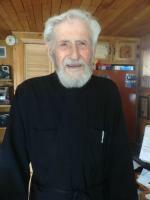 This story, written by Michael Price and published by the Conciliar Press (now Ancient Faith Publishing) magazine AGAIN in 2004, describes the remarkable life of the newly reposed Archdeacon Basil Rives of Santa Fe, NM. 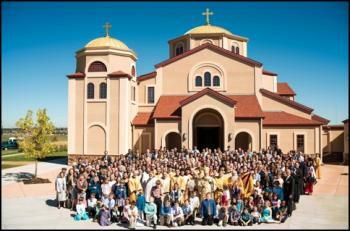 Deacon Basil Rives of Holy Trinity Orthodox Church in Santa Fe, New Mexico, is a man of many names. He began his life under the name of Harold, “although for some reason I was always called Bill as a child, even though that is nowhere in my name,” he said. Other monikers include Hal and Slim. Nowadays, his fellow parishioners know him affectionately as Fr. Basil. Like many veterans, no matter from which war, his military experiences have affected and solidified his spiritual beliefs. “The joy of the whole world hath shone forth to us from the two righteous ones, Joachim and Anna, the all-extolled Virgin, who because of her surpassing purity became a living temple of God, and alone is known as truly Theotokos. Wherefore, by her intercessions, O Christ God, send forth safety to the world, and to our souls the Great Mercy”. 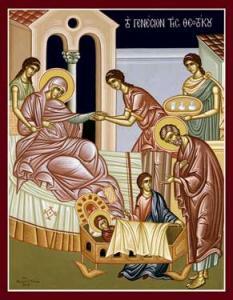 We greet you with love and joy on this Feast of the Nativity of the Most Holy Theotokos. The Aposticha from the Vespers of the feast which is quoted above transmits to us the essence of this feast. We are first joyful for the birth of Mary, since the birth of a child is a great gift granted by God. I send you greetings on behalf of the new officers and coordinators of the North American Board (“NAB”) of the Antiochian Women. We were blessed to have been sworn in by His Eminence Metropolitan Joseph on Wednesday, July 22, 2015 during the Archdiocese Convention in Boston, Massachusetts. Earlier that same day at the Antiochian Women’s brunch, we were honored to present a check for $142,724.42 to Metropolitan Joseph – in the presence of His Beatitude John X – for our 2014-15 Project: “Nurturing the Seeds of Orthodoxy Across North America: Regional Camps and Learning Centers and Monastic Communities.” We also presented His Eminence with a check for additional contributions to our 2013-14 Project to “Help the Orphans of War in Syria,” for a combined total of $300,095.00. God bless each of you for your magnificent efforts. Knowing that we will not allow ourselves rest, Metropolitan Joseph tasked us with a NEW Project: “Hungry Children At Home and Abroad.” Read information about this very worthy cause from our Vice-President/NAB Project Coordinator, Kh. 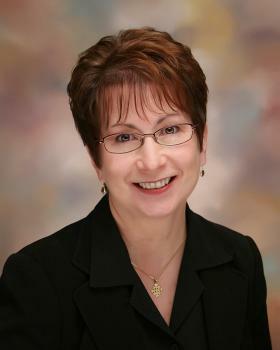 Suzanne Murphy. "O Word of the Father from before the ages, Who, being in the form of God, broughtest creation into being out of nothing; Thou Who hast put the times and seasons in Thine own power: Bless the crown of the year with Thy goodness; give peace unto Thy churches, victory unto Thy faithful hierarchs, fruitfulness unto the earth, and Great Mercy unto us." Listen to Fr. Thomas Hopko speak about the New Year on Ancient Faith Radio. The Spirit of the Lord is upon me, because he has anointed me to preach good news to the poor. He has sent me to proclaim release to the captives and recovering of sight to the blind, to set at liberty those who are oppressed, to proclaim the acceptable year of the Lord. And he closed the book, and gave it back to the attendant, and sat down; and the eyes of all in the synagogue were fixed on him. And he began to say to them, 'Today this scripture has been fulfilled in your hearing' (Luke 4:18-21)." 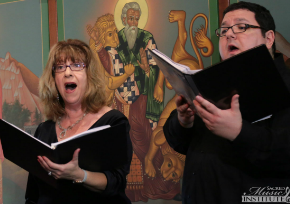 Plans are underway to refresh and expand the online resources available to musicians in the Antiochian Archdiocese. In May, 2015, His Eminence Metropolitan Joseph appointed Paul Jabara of Montreal, Quebec to be the new Chairman of the Archdiocese's Department of Sacred Music. Mr. Jabara will be working closely with the Department of Internet Ministry to update the architecture and design of the Sacred Music website, with the goal of significantly improving the music library through a revamped site map and the addition of new resources. In a presentation at the 2015 Archdiocese Convention in Boston, Mr. Jabara articulated an expanded vision for the Department of Sacred Music. In addition to upgrading the online Sacred Music Library, the Department plans to build up the youth music ministry program, create a choir outreach ministry, develop a virtual choir, and increase the amount of scholarship money for the Sacred Music Institute (SMI). 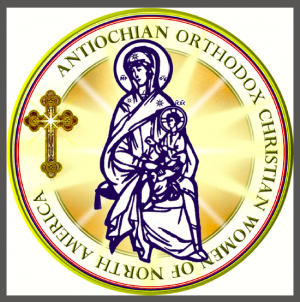 A new prayer section was recently launched on Antiochian.org. The section is linked on the Archdiocese website's homepage "Worship & Devotion" sidebar and in the footer navigation, and is available across all devices. This means that the most popular sections of A Pocket Prayer Book, the well-loved Antiochian Archdiocese spiritual resource affectionately known as "The Little Red Prayer Book," are now readily available to Antiochian.org's many weekly visitors. So far, the collection of online prayers includes: Morning Prayers, Midday Prayers, Evening Prayers, Occasional Prayers, Prayers in Preparation for Holy Communion, Prayers of Thanksgiving After Holy Communion, Self Examination Before Confession, and Prayers After Confession. Other prayers may be added as appropriate. 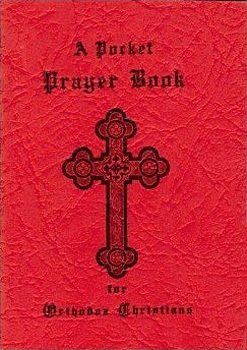 The original prayer book, containing Daily and Occasional Prayers as well as the Divine Liturgy of St. John Chrysostom, was first published in 1956 and is in its thirteenth printing. Order a hard copy from the Antiochian Village Bookstore. 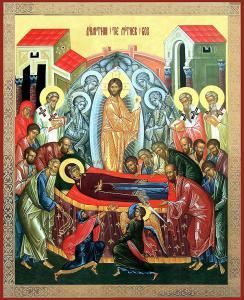 We greet you with love and joy on this Feast of the Dormition of our Most Holy Lady Theotokos! The Apolytikion quoted above transmits to us the essence of this feast. The Most Holy Lady Theotokos, in her falling asleep, has shown us the true meaning of the term “falling asleep in Christ”. We do not focus on her death, but rather her translation from her earthly life to her eternal life in heaven. These words best describe the communion of the apostolic Orthodox Church of Antioch that can never be broken, even if oceans keep her children at a distance from one another. Our Lord, God and Savior Jesus Christ is at the center of the Antiochian communion, manifest by the apostles and their spiritual descendants who proclaimed Christ’s gospel in all corners of the world throughout all ages. We greet you with love and joy on this Feast of the Transfiguration of our Lord and God and Savior Jesus Christ on Mount Tabor. The text above transmits to us the essence of this feast. Whereas our Lord Jesus Christ had previously revealed His divine power through His working of miracles, He now physically reveals “the glory of His divine form” to Peter, James and John on Mount Tabor. The great prophets Moses and Elias appear with deference to the Lord further revealing that the prophets are His servants, and that our Lord Jesus Christ rules as King above all creation. 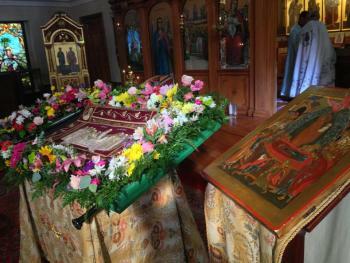 Icons of the Dormition of the Theotokos, the patronal feast of St. Mary Antiochian Orthodox Church of Cambridge, MA, host parish of the 52nd Archdiocesan Convention.The Liturgical Texts for August, blessed by His Eminence Metropolitan Joseph, are now ready for clergy and laity to download from the Online Liturgical Guide. This month, the last of the Orthodox Christian liturgical calendar, features two of the twelve Great Feasts celebrated by the Church: the Transfiguration of our Lord, God and Savior Jesus Christ (August 6); and the Dormition, or Falling-Asleep, of the Most-Holy Theotokos, the Ever-Virgin Mary (August 15). Celebration of these two feasts are not limited to one day each, but are expanded to seven days after the Transfiguration, and eight days after the Dormition. 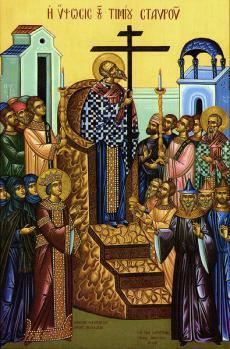 In preparation for the Dormition, many parishes sing the famous Paraklesis Service with the Little Supplicatory Canon to the Theotokos. 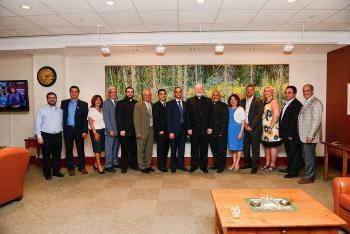 On July 28, 2015, His Eminence Metropolitan Joseph, Primate of the Antiochian Orthodox Christian Archdiocese of North America, hosted a dinner in honor of His Beatitude John X, Patriarch of Antioch and all the East, at the Archdiocese headquarters in Englewood, New Jersey. 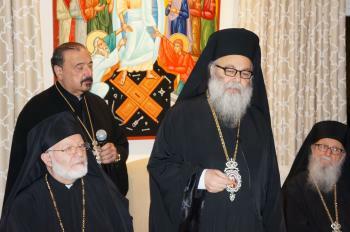 In attendance were the Antiochian hierarchs who accompanied the Patriarch, the first hierarchs of the Orthodox Churches who are located in the NY/NJ metropolitan area, representatives from the Roman Catholic church, the Syriac Catholic church, local Muslim spiritual leaders, and diplomats representing Syria, Georgia, Lebanon, and Cyprus. His Eminence Metropolitan Joseph introduced His Beatitude and spoke about the tireless work of His Beatitude for peace in Syria, Lebanon, and the entire region. (The remarks of Metropolitan Joseph are here). 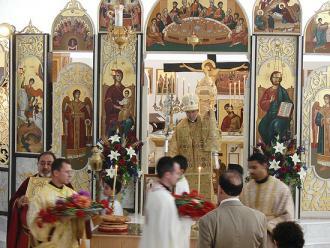 With one patriarch, fifteen metropolitans and bishops, scores of clergy, two large choirs and nearly 2,000 faithful, the 52nd Convention of the Antiochian Orthodox Christian Archdiocese of North America concluded, as is tradition, with the celebration of the Divine Liturgy on Sunday, July 26, 2015. This year, leading worship inside Boston's Hynes Convention Center Auditorium – converted into a church for the gathering's purposes – was the father and chief shepherd of the ancient Orthodox Christian see of Antioch, His Beatitude the Most Blessed Patriarch John X. He described the partaking of the "Lamb of God" as "the fulfillment of the work of this convention." "You are the children of God, as St. Paul tells us," His Beatitude said in his sermon, referring to Sunday's Epistle lection from Galatians (3:23-4:5). "This directs us to the dignity that is our relationship to the likeness of the Father. This is a means of strength, to be called the children of God, but it should also give us a sense of humility."